Deep sea divers. Little leaf men. Suburban water buffalo and lost dugongs. Giant mechanical penguins and getaway cars filled with turtles. All these arresting, ingenious images and so much more await the lucky reader who enters Tan’s whimsical world of “Outer Suburbia.” Not quite a graphic novel, not quite a picture book, this strange amalgamation of pictures and prose (some only a page long) reads like a collection of colorful and creative detritus Tan discovered in the crooked corners of his superior imagination that he then picked up, dusted off, and polished into small, perfect gems. 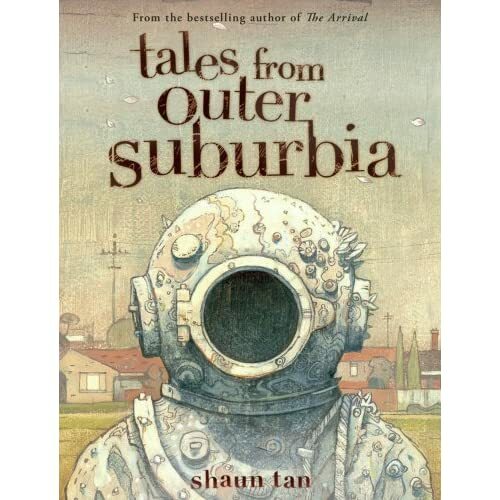 “Eric,” which chronicles the adventures of a small exchange student who marvels at the complexity of his host’s home, will immediately bring to mind Tan’s gorgeously wrought The Arrival, his wordless homage to the immigrant spirit. Others gently emphasize themes of hope, peace and bravery in the face of adversity. Like “Alert But Not Alarmed,” where a neighborhood finds a way to humorously re-purpose the missiles the government requires them to keep in their backyards. Or “No Other Country,” where a family, fed up with the dry, arid environment of their new home, discovers a lush hidden courtyard that exists only in that sweet geographical spot, giving them cause to appreciate a place they used to loathe. In this celebratory season where I am part of a community that often argues over competing holiday symbols, I was especially moved by “The Nameless Holiday.” Here, Tan describes in both words and pictures a holiday that moves around the calendar and is characterized by everyone choosing the object they love most. These treasures are then left hanging on the television antenna as an offering for a giant reindeer, who carefully carries them away, making the participants feel special and chosen instead of regretful and sad. Depending on how you feel or where you are when you open this wonderful tome, the stories will seem sad, happy, hopeful or tragic. But they all share one thing in common—they are born of Tan’s unique and singular vision and therefore are simply not to be missed. When her father dies, seventeen-year-old Charlotte Miller assumes the ownership of Stirwaters Mill, which her family has run for generations. The work isn’t easy, but Charlotte is supported by the goodhearted townspeople of Shearing, whose livelihoods depend on the mill’s business. Still, bad luck dogs Charlotte’s every step and despite all her hard work, she finds herself on the brink of losing Stirwaters. Enter Jack Spinner, a mysterious wanderer who in exchange for very little, miraculously manages to spin a room full of straw into pure gold thread. Practical Charlotte doesn’t believe in magic, so she doesn’t think too hard about the thread’s origins and hides her ill-gotten treasure from her gentle fiancée Randall. Each time a disaster befalls Charlotte’s business, Jack Spinner appears with his nimble fingers and an offer she can’t refuse. But when Jack asks for the ultimate sacrifice, Charlotte must finally admit that something supernatural is going down and if she wants to save her family and friends, she’s going to have to get to the bottom of it. Before she knows it, Charlotte is embroiled in a mystery several decades old that involves an ancient curse, a wrongful death and a vengeful ghost. Who is Jack Spinner? What does he really want from Charlotte? And will she be able to find out in time to rescue the mill and everything she holds dear? Though newbie author Elizabeth C. Bunce takes her time weaving this Rumpelstiltskin re-telling, the payoff is worth it when Charlotte faces down her family’s surprisingly sympathetic mortal foe once and for all. Set in Industrial Revolution England, the rich historical details give this familiar tale an even meatier warp and weft, and Charlotte’s character development from a rule abiding, levelheaded girl to a strong, open minded woman ready to do anything to save her loved ones is a pleasure to behold. Curse was also chosen as one of the finalists for the very first William C. Morris YA Debut Award, along with Madapple, one of my 2008 Top Ten books! It’s 1947 and fifteen-year-old Evie is in a big hurry to grow up. She’s sick of her gorgeous mom Bev always stuffing her into little-girl dresses and making her wipe off her lipstick. So when her stepfather Joe proposes a family holiday to swanky Palm Beach, Evie jumps at the chance to recreate herself on vacation. Her opportunity to do so arises when she meets Peter, a dishy ex-G.I. friend of her stepfather’s who’s also staying in Palm Beach. Peter is a twenty-three-year-old Hottie McHotster and a total flirt. Though Evie’s mother seems to enjoy Peter’s company, Joe seems sullen and resentful anytime he’s around. Slowly it becomes clear to Evie that Peter wants something from her family—but what? Does he really like Evie, or is he just using her to get closer to beautiful Bev? Or maybe his true target is Joe, and Evie is just an afterthought in his pursuit of a business deal with her stepfather. The answer is revealed when a tragic accident forces Evie to choose between Peter and her parents, and the decision she makes surprises even Evie herself. Though it takes place almost fifteen years earlier than the 1960’s cable sensation, this slick hist. mystery reminded me of the glamorous yet repressed world of Mad Men, where no one shares their real feelings and family secrets are swept neatly under the rug. 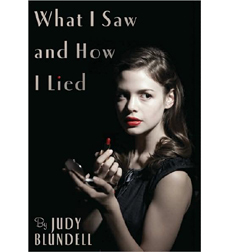 Judy Blundell’s sophisticated teen noir is not only one of the few true mysteries in YA Lit. Land, it’s also one of the best. But don’t just take my word for it—Blundell’s book was also crowned the winner of the 2008 National Book Award for Young People’s Literature, despite some very tough competition.